Left to right, PSG Construction co-owner Stephen Gidus; Jack Machise of JLM Services, Inc.; Sam Wagner of PSG Construction (bending down); and Larry Leftwich of PSG Construction help rebuild the stairs for a homeowner. Dedicated to helping those in need, PSG Construction volunteered to assist the charitable organization Rebuilding Together on Saturday, February 5, 2005 by donating staff volunteers and materials. Rebuilding Together helps homeowners whose residences are in need of repair and maintenance, but are not financially or physically able to complete the projects on their own. 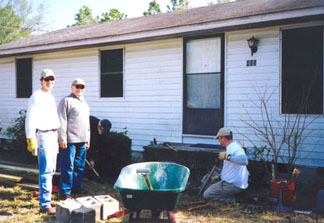 PSG Construction employees helped rebuild a homeowner’s exterior steps and remove a damaged shed. 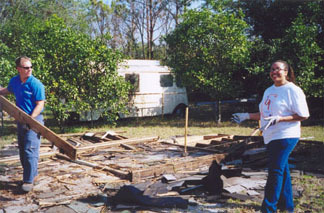 PSG Construction employee Tera Ross, right, and Kyle Repp with 1-800-Got-Junk, help remove a damaged shed for a homeowner. The charitable organization was adopted as an outreach program by the Remodelors’ Council of the Home Builder Association (HBA) of Metro Orlando. PSG Construction co-owner Stephen Gidus currently serves as a board member of the central Florida chapter of Rebuilding Together.